Nine decades of motoring are represented in the entries for Barons' sale of Classic, Collectors, Sports & Prestige cars at Sandown Park next Tuesday, June 15th. The earliest car is the 1929 Chrysler 65, a real head-turner with its two-tone paint. And the most recent is another head-turner - an outstanding 2002 Dax 427 Cobra. The sale has something for all enthusiasts, whether they're into quintessential British thoroughbreds, charismatic starter classics, sleek sportscars, muscle cars or want to head off road. There's even something for movie buffs, who can get 'Back to the Future' with the 1981 DeLorean DMC12. British thoroughbreds include a fine, rare 1953 Alvis TB21 Roadster and a 1949 Bentley MkVI which was converted to diesel in the 1960s. 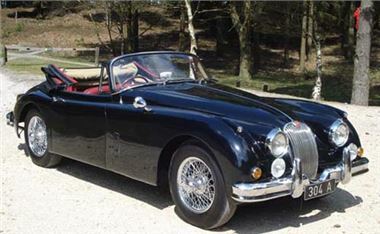 Keeping to the British theme, Barons often features a strong Jaguar entry in its sales, and there are no less than 19 Jaguars and Daimlers on offer, including a beautiful 1962 S1 E-type Roadster. And Land Rover fans have four to choose from, including a 1949 Series One 80" SWB which has undergone a nut and bolt restoration and is described as being 'as new'. A full list of cars for the sale appears below. For further information please visitwww.barons-auctions.com, email info@barons-auctions.com or call 08454 30 60 60.